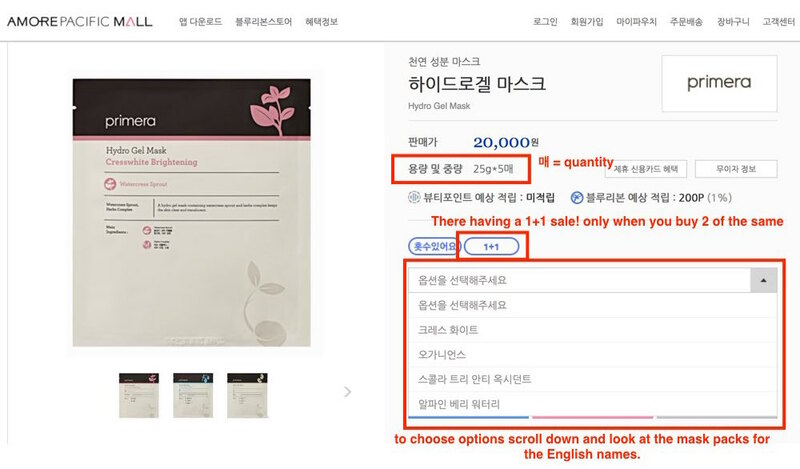 In this guide I am going to show you exactly how to find specific items, decide on product options and the get the required information to order off of AmorePacificMall using KoreanBuddy. Amore Pacific is a massive group of skincare and make up brands including Aritaum, IOPE, Laneige, Mamonde, Hanyul, Ryo, Happy Bath, Lilikos, Illy, Sulhwasoo and a many many others. I am highlighting this site because it includes many popular brands at the best prices and when you order these items from KoreaBuddy you will be saving costs over any of the English sites you find the same items on. I list a couple examples in this guide. Tip #1 – The search doesn’t work well in English. Don’t bother using it to search for brands, instead try searching for product categories such as lip stick or eye liner. That works much better in English. If you want to search brands see the first picture below for all translations. Tip#2 – For items with multiple options/colours, scroll down on the product page and look at the pictures and numbers and choose your options that way. When you order from KoreanBuddy you can just write “option #1 orange” or just “option #1” like so. Order form here. I suggest starting with the brands menu if you have an idea which brands you are interested in. I have translated them all for you below. 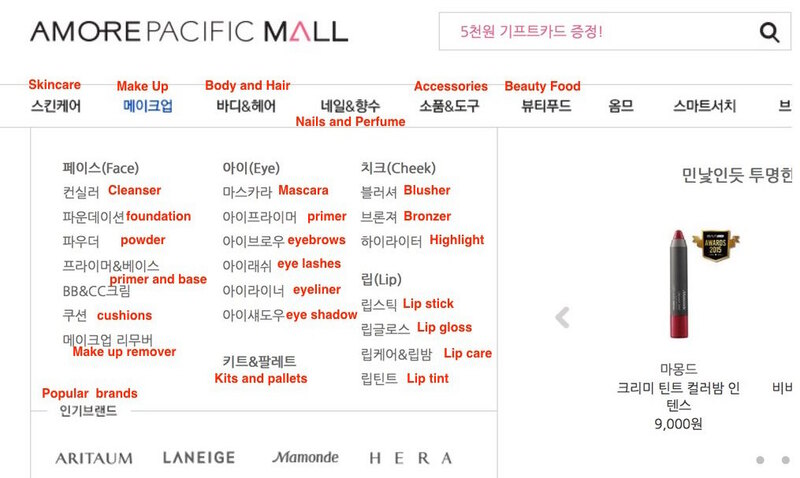 Next, here are the skincare menus and make up menus all translated to help you find what you’re looking for. Let’s try to find some face masks (sheet masks) because everyone needs more face masks! Start by hovering your mouse over the skincare menu on the left side of the screen, then move down and to the middle under “special care” and you’ll see the first options is masks & packs. Don’t be surprised at the prices of the Illy or Primera hydro gel masks, those prices aren’t for 1 mask, they are for 5 or 10. To see the number of masks in the pack check out the pic below. 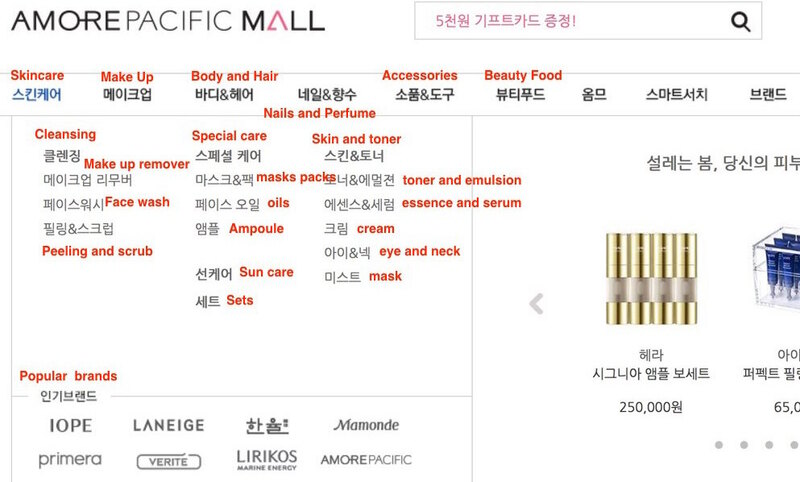 You can see it says 25g * 5매 this means 5 masks for this price. Also below you can see a 1 + 1 box. If you buy 2 of the same kind of mask you still only pay the 20,000 won price. So this is 10 masks for 20,000 won. All of the options are in Korea, but if you scroll down you will see the 4 types of masks written in English. Here they are Cresswhite Brightening, organience, scholar tree anti-oxidant, and alpine berry watery. When order from KoreanBuddy you can write the names in English and add the comment 1 + 1 in the notes. To order items from Amore Pacific Mall with KoreanBuddy copy and paste the URL into my order form. Let’s now try searching by brand. How about Sulhwasoo. Some brands like Sulwhasoo have English websites. In this case I suggest searching the English site and then just letting me know the product name in English if you can’t find it on Amore Pacific mall. Alternatively each package does have the English name written on it. You can click on the items and see the English name which usually explains what kind of product it is. The prices on Amore Pacific mall are significantly cheaper than the English sites and this is where KoreanBuddy really comes in handy. Examples Sulwhasoo gentle cleansing oil English site $38.00 Amore Pacific mall $35.19 (=KoreanBuddy’s price), Snowise EX ginseng exfoliating gel English site $60.00 Amore Pacific mall $48.39 (=KoreanBuddy’s price). Congratulations you just saved about $15. The KoreanBuddy fee is 10% or $9 minimum and that’s without the referral discounts! If you have any questions about Amore Pacific mall or any other Korean websites just drop me a message at support@koreanbuddy.com I’m here to help you buddy.